Welcome back. If you’re just tuning in, allow me to catch you up: This post is the second in a two-part series on our experiment to move gated offer content onto a site page, and test different conversion methods. If you missed Part I, check it out here. Back in Part I, we saw significant increases in organic search traffic only on offers that already were performing well for search. Also, our Conversion Rate Optimization (CRO) test failed. So in Part II, we turned our focus to running more CRO tests. In order to avoid putting many more conversions at risk, we decided to test the offers we’d already experimented with to find a conversion method that worked well. We tested two of the three offers we experimented with in Part I, but this time, our approach was a bit different. Let’s walk through what we did for Part II of our CRO Test, followed by the results of both tests. Does Un-gating Offers Improve Conversion Rate? In Part I, we hypothesized that by partially gating the content on our newly-created HTML offer pages, we could provide a better user experience and still generate leads from it. Decided the content was not valuable enough for them to exchange contact information to see the rest of it. Expected to be able to read the entire offer, and were put off by the experience of running into a form upon scrolling. So, we took each of these findings and used them build two tests within Part II of the experiment, each with its own sub-hypothesis, but a shared objective: to increase net submission and contact numbers, so that they’ll surpass those of the original landing pages pointing to gated PDFs. 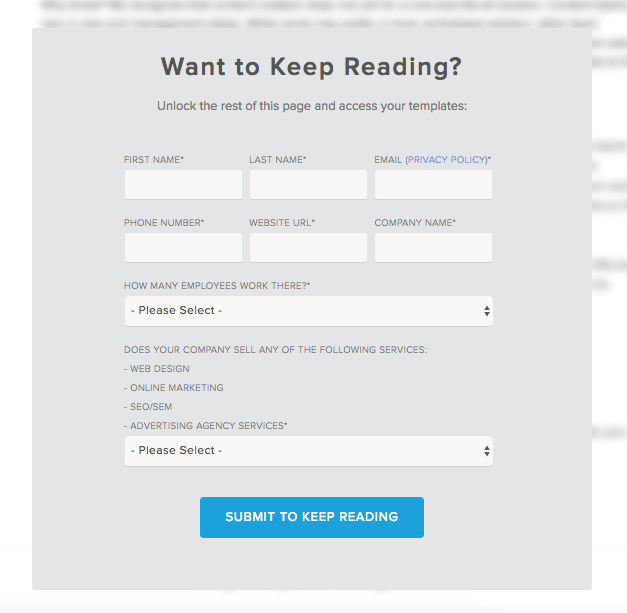 Hypothesis: By hiding all of the written content behind a partial gate template — with the blur effect pictured below — readers arriving at the site through search will be intrigued enough by the topic to convert on the page. Hypothesis: By setting the expectation of a gated offer early on — by using a form that looks and reads just like our normal landing pages, but opens into an HTML page upon form submission instead of an offer download — more people will fill out the form. So, we pitched the idea of a brand new, gated template that looks and reads just like our regular landing pages, with one key difference: When the user clicks the form submission button, the page opens into an HTML page, instead of leading to a thank-you page with a PDF download button. While that HTML content exists behind a CSS layer initially blocked by the template, it turns out that Google is still able to successfully crawl and index it. Our theory was that, because Google has much more high-quality and optimized content to crawl on the landing page, organic traffic will still flow to the page. Plus, if you can increase organic traffic significantly to the landing page, while also retaining the high conversion rates of the original landing page design — jackpot. 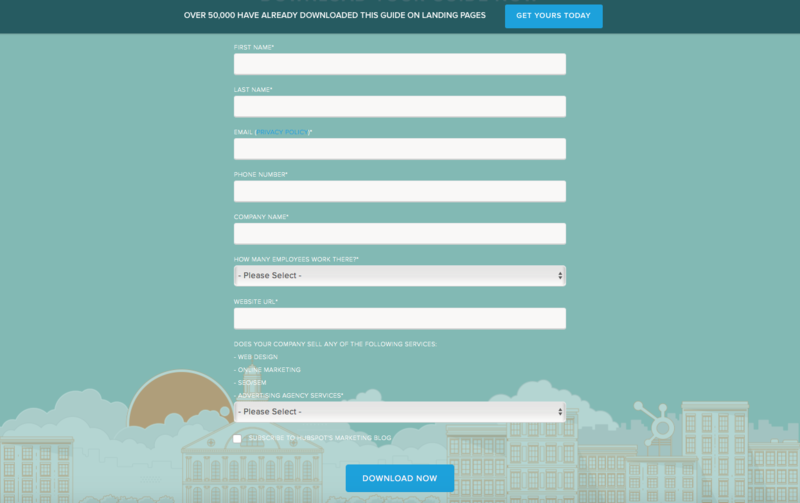 The only other difference between this template and our normal landing pages is that this one uses a shorter version of our typical landing page lead generation form, requiring less information and investment from the user. 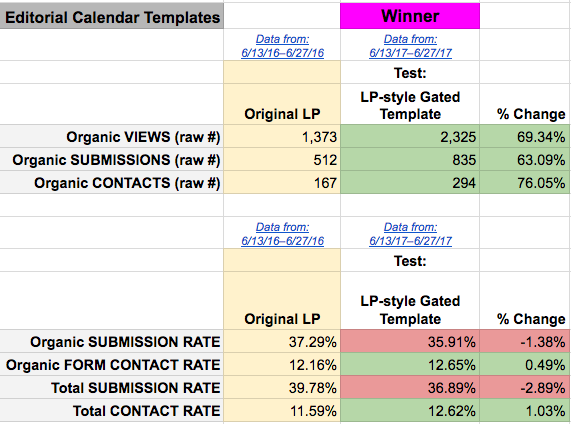 While the submission rates for this variation were still much lower than those of the original landing page, they were slightly higher than those of our CRO tests from Part I. So when push comes to shove, it seems, the partially-gated template is simply not effective for lead generation. It was time to move onto Test #2. 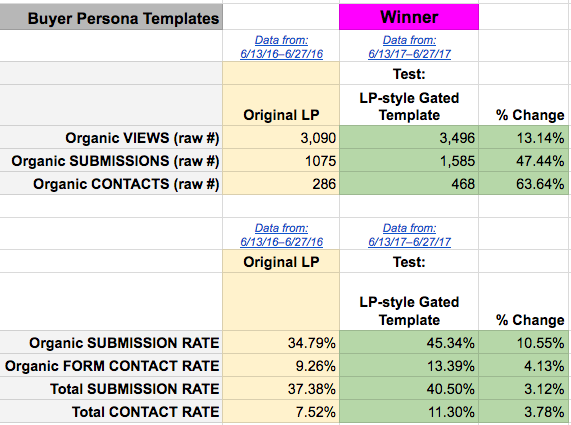 Using the new un-gated template, the two offers we tested both achieved significant increases in net organic submissions and contacts, compared with the original landing pages. Organic submissions increased by 47.44% and 63.09%, respectively. Organic contacts increased by 63.64% and 76.05%, respectively. 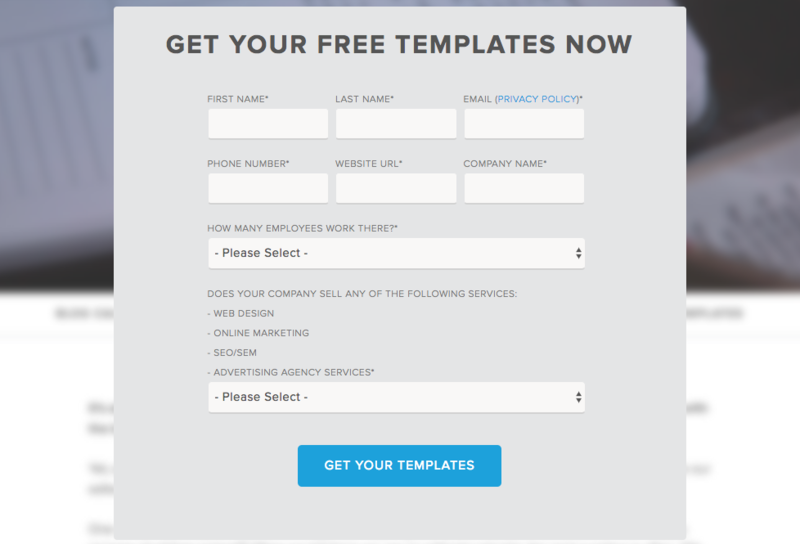 In other words: The landing-page-style gated template is an effective one for lead generation. By lifting conversions to their original rates — or better — while simultaneously getting that boost in organic traffic from the crawlable offer content, both offers achieved significant increases in net organic submissions and contacts. So … Is It Okay to Hide Content Like This? We’ve mulled over this question, and we think the answer is, “Yes — it’s okay.” Here’s why. 1) We’re not tricking the search engine or the user. There’s a black-hat SEO tactic that comes to mind here called “cloaking” — which refers to methods of manipulating SERP ranking, like hiding content written in white text with a white background, or serving different content to search engines than you do to your users. But the key difference between cloaking and what we’re doing is that, once users actually open the gate, they seeing the exact same content the search engines see. When you have a business need, we don’t discourage gating content — but we strongly advise against hiding in the ways we described above. However, content can still be gated in a way that provides a better user experience, which was part of the impetus behind this experiment. 2) Mobile favors hidden content, so Google has been relaxing its policies. As web usage has shifted toward mobile, expandable and hidden content has become more acceptable. With more people searching on mobile devices than they do on desktops, Google has had to adjust its algorithm to accommodate the fact that mobile design actually favors hidden content. Better web designers hide content on mobile pages because it makes them look cleaner, and avoids bombarding visitors with masses of text, so that it’s easier for them to find what they’re looking for. For that reason, if Google were to penalize hidden content, they’d effectively be penalizing mobile. But if, somewhere down the line, Google decides to stop indexing the content on these pages, that would call for a modified template design. In Part I, we learned — much to our chagrin — that we could increase organic traffic by putting offer content onto an HTML site page only for offers that were already receiving strong search traffic. That reinforces to the idea of historical optimization: If a page already performs well in organic traffic each month, and you increase the depth of that content and optimize it even further for search, then odds are, you’re going to see outside returns. For that reason, we recommend focusing on transferring only the offers from PDF > HTML that are already generating high organic traffic, and have pre-existing search authority. To begin prioritizing, try pulling a list of your most popular offers, and rank them by organic traffic. In the meantime, we’ll continue putting our findings into practice, and will keep you posted on anything valuable that we discover along the way. Have you ever conducted similar tests? Comment below with your best experiment — and hey, we might even feature it on our blog.